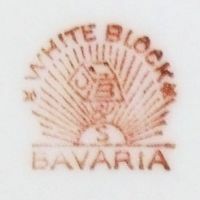 Until now nothing is known about the company itself except that it appears to be another unidentified U.S. importer and/or distributor which obviously imported items from Germany (including Bavaria) and Czechoslovakia. 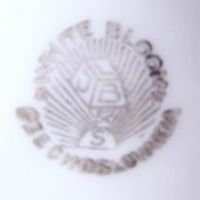 Most people refer to this company merely as 'White Block' as there are varying opinions upon the sequence of the initials used in the marks. 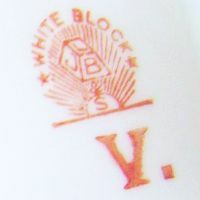 'WHITE BLOCK' sunburst 'J L B & S' mark in red, with 'BAVARIA' addition. 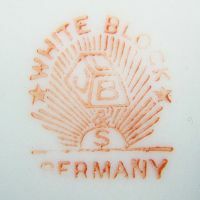 'WHITE BLOCK' sunburst mark in red, with 'GERMANY' addition. 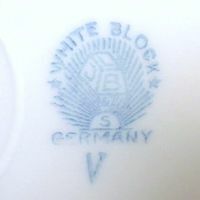 'WHITE BLOCK' sunburst mark in blue, with 'GERMANY' addition (not shown: covered original manufacturer mark). 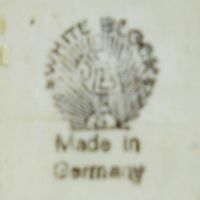 'WHITE BLOCK' sunburst mark in dark green, with 'MADE IN GERMANY' addition. 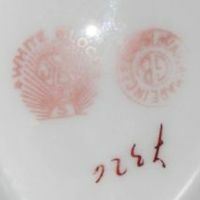 'WHITE BLOCK' sunburst mark in red, accompanied by original manufacturer mark of Gebrüder Benedikt (Meierhöfen, Bohemia). 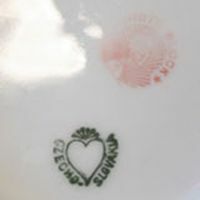 ... but accompanied by original manufacturer mark of Gebrüder Benedikt (Meierhöfen, Bohemia). 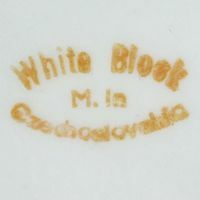 'WHITE BLOCK' sunburst mark in black, with straight 'CZECHOSLOV.' addition. 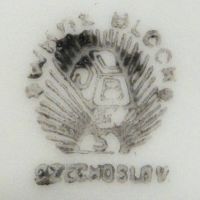 'WHITE BLOCK' sunburst mark in black, with curved 'CZECHOSLOVAKIA' addition. 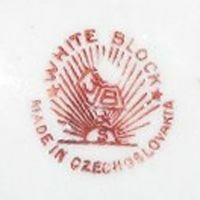 'WHITE BLOCK' sunburst mark in red, with curved 'MADE IN CZECHOSLOVAKIA' addition. Something *completely* different: simple 'WHITE BLOCK' above 'M. 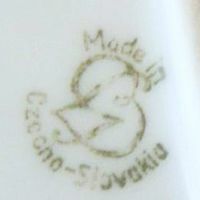 IN CZECHOSLOVAKIA'.